On a recent trip to Colorado, in an railroad town in the shadow of the Sangre de Cristo Mountains–right in the heart of the Rockies–I was lured off the main street and up the steps into a 100-year-old, brick building to find Paulette Brodeur painting in the hallway. She was putting the finishing touches on an expressionist painting of a jazz combo. She introduced herself as she waved her paintbrush full of bright blue paint around in the air. Her galleries were filled with whimsical paintings of everything from wild horses and mountain landscapes to a poodle with the Eiffel Tower in styles echoing great names like Raoul Dufy and Pablo Picasso, all in bright, exuberant colors that echoed Paulette’s personality. I rounded the corner into one brightly lit room to find this painting on the wall. It not only struck me for its beauty, but it felt a little like home. It reminded me of paintings by Grace Hartigan, who once painted in the city in which I now park my boots. And it was inspired by a statue of Mary in the great Notre-Dame Cathedral in Paris, in the shadow of which I studied French during college. To be so far away from home and to find her smack dab in the middle Colorado was a treat. And Paulette was generous enough to let me share her with you. 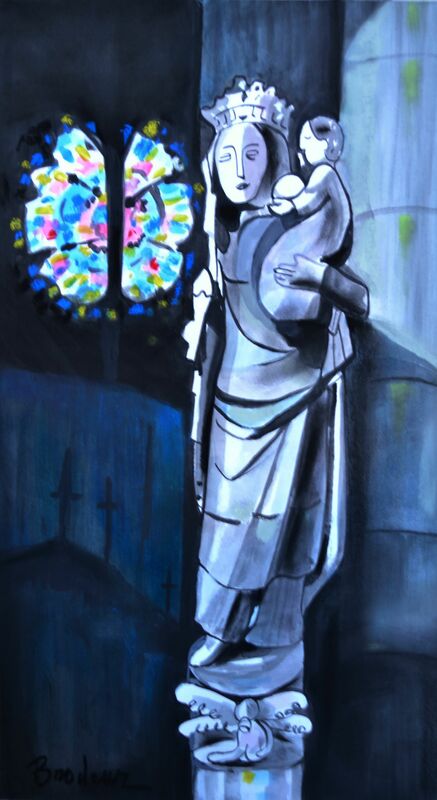 This painting is part of a series inspired by Notre-Dame Cathedral, completed after Paulette visited the city in 2013. You can see more of Paulette Brodeur’s artwork on her website, http://www.brodeurart.com. Her gallery space is in the process of moving, so you won’t find her at the top of the stairs anymore, but you can find her online. Eight-year-old Dominic McKenney waves at the two men riding a crane to the top of the golden Virgin Mary statue at the National Shrine Grotto of Our Lady of Lourdes in Emmitsburg, Maryland. Equipped in hard hats and smiling to the crowd, they lift a giant crown of silk flowers of red yellow and purple 100 feet in the air and set it on the head of the 25-foot-tall statue that looks over this Catholic mountain shrine devoted to the Mother of God. “She is the mother of Jesus. She is the mother of everyone,” Dominic says. Today is a special day here and in Catholic centers around the world. 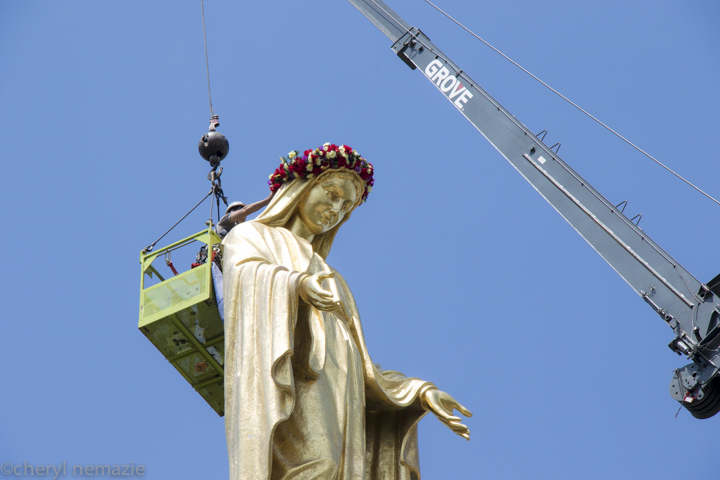 It is the first Sunday in May, a month dedicated to Mary, and statues of all sizes are being crowned in similar ways–but most probably without the need of a crane. The crowd holds up cameras and phones to snap pictures of the men laying the crown on her head, squinting against the sun. They cheer and applaud when the flowers have been placed, silk streamers flowing down her back. A perfect fit. 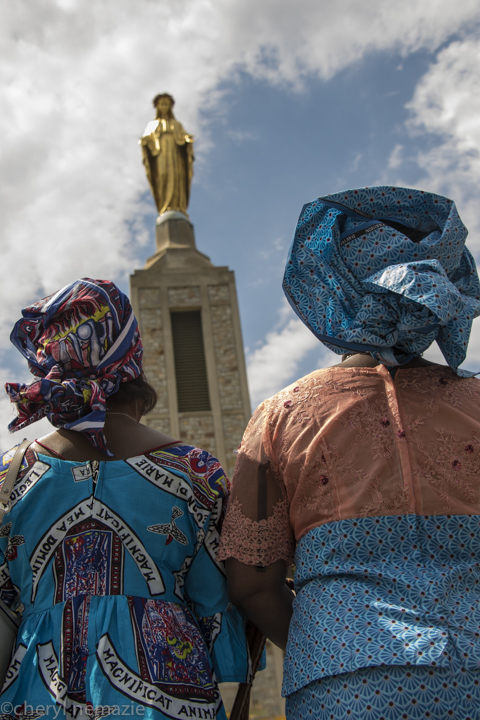 Thousands gathered the crowning here at this replica of the Lourdes shrine in France, tucked amongst winding paths lined with azaleas bursting with purple blooms, and statues of the Blessed mother. The month of May has been dedicated to the Blessed Virgin Mary since Medieval times, honoring her as an example and devotion has been especially emphasized by recent popes who raise her up as an example of how to love and grow ever closer to God. Finally, The Mary Project begins. An idea that has been whispered in my ear for months, if not years. A multimedia project that explores what Mary, the Mother of God, means to ordinary people like you and me. 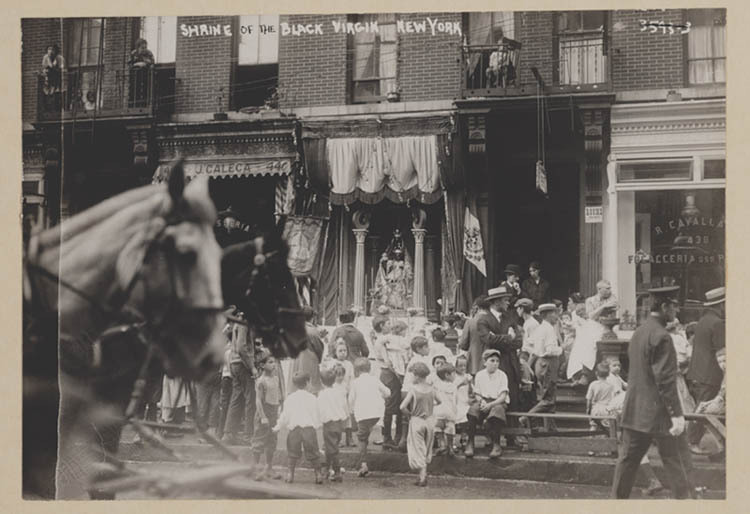 We will be talking to folks, reading books, visiting grottos and gardens, taking pictures and videos, and bringing them all together in one place to find out the many ways Our Lady impacts the lives of those across America, and the world, today. It begins in the month of May, Mary’s month, with the crowning of Our Lady’s statue at the National Shrine Grotto of Our Lady of Lourdes in Emmitsburg, Maryland. 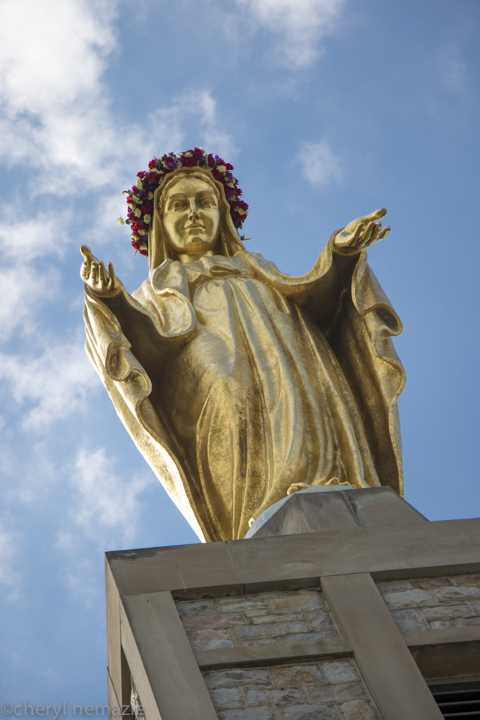 There, for the first time, a 12-foot-long flower crown will be raised high into the air, on the top of this meditative mountain, and onto the head of a 25-foot-high golden statue of Mary. Here is where our journey officially begins, as we not only tell your stories, but begin to discover our own. Join us by signing up to receive updates on The Mary Project and follow us on Facebook and Twitter. This morning before I set off on my journey, a dragonfly appeared hovering above my windshield. I was in a parking lot in a shopping mall, nowhere near a field or marsh. And it hung there as began to drive, flying just a few inches ahead of me, like it was leading somewhere. It stayed with me for a good ten seconds, and disappeared as mysteriously as it appeared. 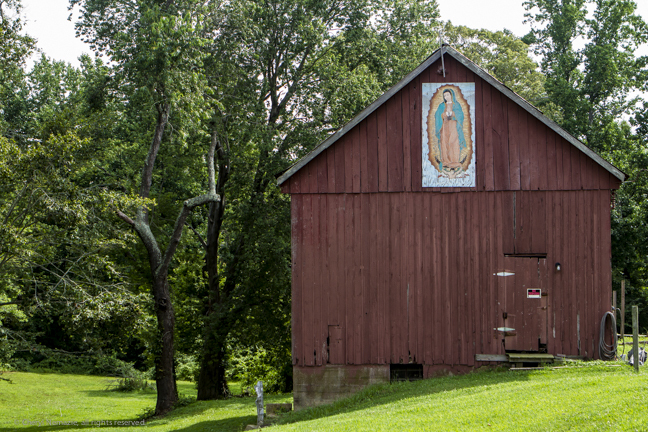 “There’s a barn up here with a beautiful painting of Our Guadalupe on it. I want to stop and take a picture of it,” I said. Cheryl and I were careening down a four-lane highway in rural Calvert County, better known for conservative Republican farmers than a Mexican barn-painting Catholic. “We should travel across the country and write a book called ‘Mary in America,” Cheryl said, going on to explain the coffee table book we could work on together. She’d take the pictures of the people, places and things – and I’d write the stories. I spotted the barn and hung a U-turn, rolling to a stop on the shoulder with cars whizzing by. Cheryl leaned out the window with her camera. “Back up a little,” she said. I backed up and the 4-foot-high panel under the eaves of the red barn came into better view between a powerline and pole. There was Our Lady of Guadalupe in all her glory. Green robe covered with stars, bursts of light behind her, angels at her feet. The plywood was weathering. The artwork was beautiful. Next the red barn was a line a pick up trucks, and I couldn’t see the house for the trees. “Back up a little more,” she said. As I inched backwards on the highway, I saw a pickup truck approaching along the shoulder in my rear view mirror. The truck was twice the size of my little hatchback, jacked up on enormous wheels with rack of spotlights affixed to the top like Mickey Mouse. “Oh my gosh, it’s the person who lives here!” I say. He pulls into the driveway and rolls down his window. Halfway. “We’re admiring your Mary. Is it okay if we take a picture,” Cheryl says, as she hops out of the car and approaches the truck. By the time I get there, she’s run closer to the barn, and I’m looking up at the man behind the wheel. The cab is lined in blue flame upholstery. He’s about 250 pounds with a day’s growth of a beard and short, curly blond hair. He’s not Mexican. He’s 100 percent Calvert County. White, male, and country. I laugh, and we introduce ourselves. “I’m glad you like her,” he says.